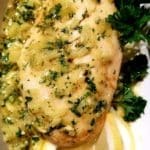 Slow cooker creamy mustard chicken thighs recipe. Skin-on and bone-in chicken thighs with Dijon mustard and heavy (double cream) cooked in 6-quart (6 L) slow cooker. Boneless and skinless chicken thighs with mashed sweet potatoes, hominy grits, shredded Monterey Jack cheese, and milk cooked in a slow cooker. Very delicious! Instructions: Line 4-quart (4 L) slow cooker with a slow cooker liner., then combine in prepared cooker chicken thighs, water, mashed sweet potatoes, evaporated milk, grits, and seasoning. Stir well. Cover the slow cooker and cook on low-heat setting for 7-9 hours or until chicken thighs are tender. Turn off the slow cooker and open the lid. Stir in shredded Monterey Jack cheese and butter. Cover again with a lid and let stand for 5 minutes or until cheese and butter are melted. Open the lid and transfer cooked chicken mixture to a serving plate. Divide chicken and vegetables between 6-8 serving plates. Sprinkle each plate with snipped fresh cilantro. Serve hot. Pat the chicken thighs dry with paper towels and season with salt and black pepper. Working in batches, add seasoned chicken skin-side down to the skillet and cook until the skin is crisp and golden-brown, turning once, for about 6 to 8 minutes. 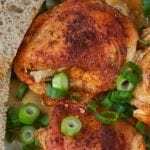 Remove browned chicken from the skillet and transfer to the slow cooker. Repeat with browning the remaining chicken thighs. Remove cooked chicken from the skillet and transfer to the slow cooker. Add diced shallots to the pan and cook, stirring occasionally, until softened. Pour in dry white wine, scraping up any browned bits at the bottom of the pan. Cook until almost evaporated, about 6 minutes. Stir in chicken broth and whole-grain Dijon mustard and bring to a simmer. Remove from the heat and pour Dijon mixture over the chicken in the slow cooker. Open the lid and, using tongs, transfer cooked chicken thighs to a serving platter. Cover with an aluminum foil and keep warm. Swith the slow cooker to high-heat setting. In a small mixing bowl, combine the smooth Dijon mustard, heavy cream, and cornstarch. Mix well. 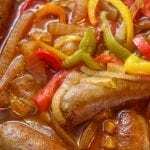 Wisk the creamy mixture into the sauce in the slow cooker. Cover the slow cooker and cook for further 30 minutes or until the sauce thickened. Season with salt and black pepper. Pour creamy mustard sauce over reserved chicken. Sprinkle with fresh parsley and serve immediately.